Sorry for the delay this week – technical problems. 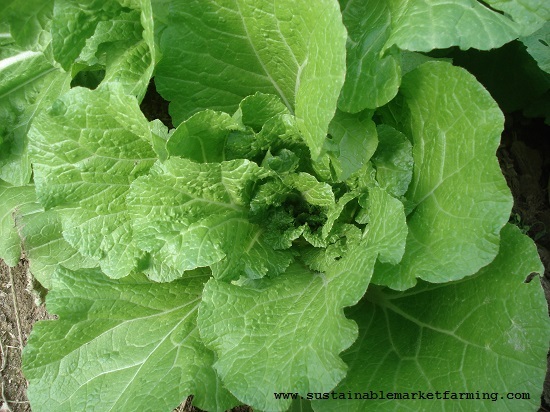 If you have Chinese cabbage in your hoophouse, January is the month to harvest it in zone 7. We do not harvest leaves from this crop, but wait for it to form full-size heads and then harvest those mature plants. We sometimes start harvesting as early as December 4, if the plants have reached full size and we “need” to harvest them. Otherwise we wait till December 15. If we have planted enough we can harvest until January 23, or sometimes as late as February 9. 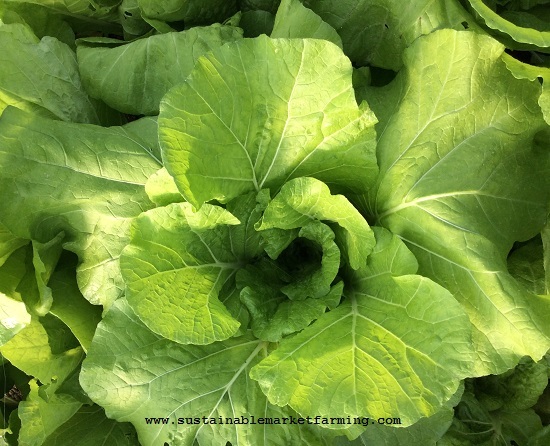 Other Asian greens we are also harvesting at this time of year include pak choy, mizuna and the frilly mustards, tatsoi, Senposai, Tokyo Bekana, Maruba Santoh and Yukina savoy. Chinese cabbage has very tender, light green savoyed leaves and is excellent for stir-fries, or pickling (sauerkraut or kimchee). 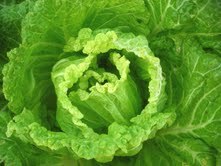 Chinese cabbage (both the Napa kind and the Michihli or Michihili kind) are Wong Bok types (Brassica rapa var. pekinensis) along with the “celery cabbages” – the non-heading Tokyo Bekana and Maruba Santoh. We like Blues, an open-pollinated “barrel-shaped” Napa cabbage, shown in the photo above. Kasumi has the best bolt tolerance and is larger: 5 lb (2.3 kg) compared to 4 lb (1.8 kg); Orange Queen is a colorful but slower-growing variety (80 days in spring). Napa and Michihili Chinese cabbages in October. The Michihili types are taller and narrower, can be transplanted closer (8″) and might make more sense in terms of space use, although Napa cabbages do store better under refrigeration than michihli types. Jade Pagoda and the O-P Michihli both take 72 days from sowing to harvest in spring – considerably slower than Napa types. 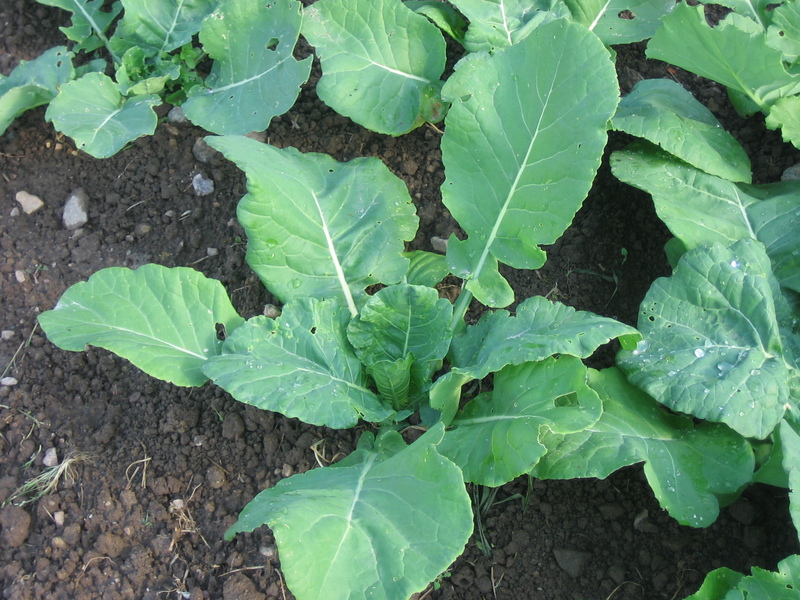 Michihili are more stress tolerant and resistant to bolting and black speck than Napa cabbage. 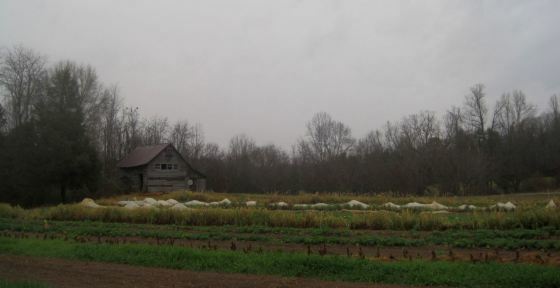 Blues takes 52 days from sowing to harvest in spring, but of course, takes longer in fall and winter. We sow September 15 in an outdoor nursery seedbed, and transplant into our hoophouse at 2-3 weeks old (October 2). It is very fast-growing in those temperatures and conditions. If we start harvesting December 15, it’s 3 calendar months from sowing, 91 days. The minimum germination soil temperature for Chinese cabbage is 50F (10C), and the ideal soil temperatures are 68F (20C) to 86F (30C). Under the ideal conditions the seedlings will emerge in 4 days. The maximum soil temperature to get any germination is 95F (35C). We plant 52 plants for 100 people, with 4 staggered rows in the 4ft bed, 10.5″ apart (every 7th tine on Johnny’s row marker rake) and plants 10″ apart. With a harvest period of 5-8 weeks, 6-10 heads per week is about right for us. 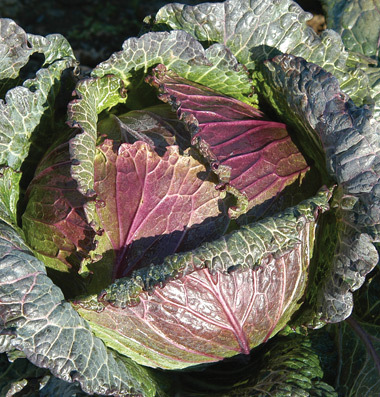 We have not had many disease or pest problems with our hoophouse Chines cabbage. 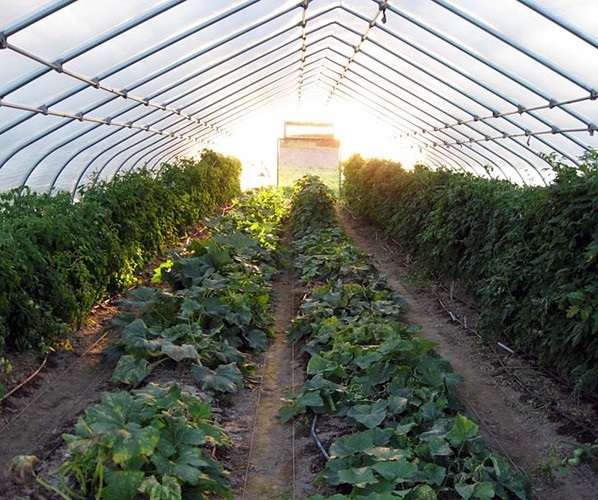 We do pay attention to using insect netting over the outdoor seedbed in the fall, but once we transplant indoors, our pest troubles are usually over. Vegetable weevil larvae have caused trouble in January. They come out of the soil at night and make holes in the leaves. They tend to prefer pak choy and turnips. We have used Spinosad against them with some success. Tipburn (brown leaf margins, including internal leaves) is caused by quick drying of the soil, when the weather makes a sudden switch to bright and sunny from overcast. Be ready to irrigate when the weather suddenly brightens. 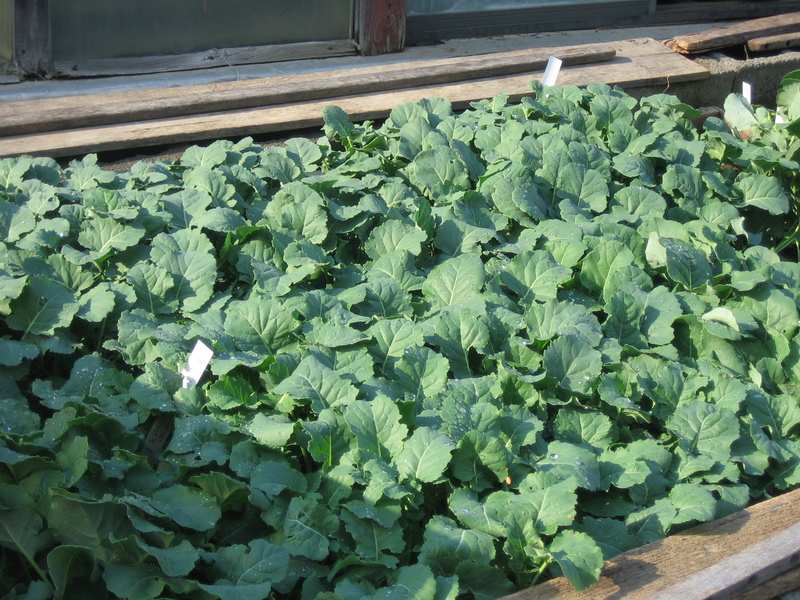 The winter-kill temperature of Chinese cabbage outdoors without protection is 25F (-4C). Our hoophouse crop has taken outdoor temps of 8F without inner rowcovers, and -8F with added thick rowcover. 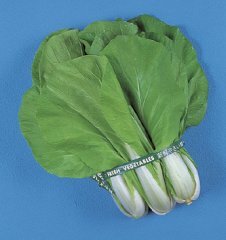 It is more cold-hardy than most varieties of pak choy, and less cold-hardy than Komatsuna, Senposai, tatsoi, Yukina savoy. 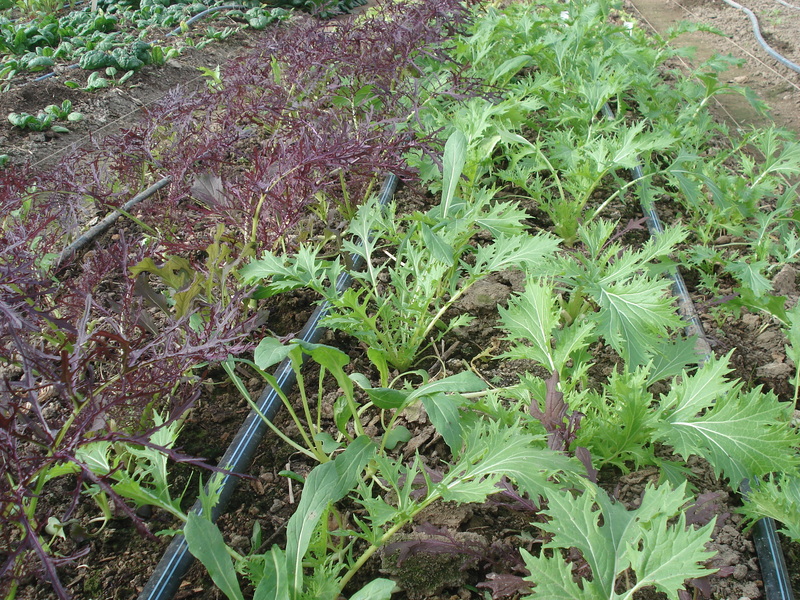 Mizuna, Maruba Santoh and Tokyo Bekana have a similar level of cold-tolerance. Once past the winter solstice, the order of bolting of Asian greens is something like: Tokyo Bekana and Maruba Santoh, pak choy, Chinese cabbage, tatsoi, Komatsuna, Senposai, mizuna, Yukina Savoy, leaf radish, frilly mustards. When it’s time to harvest, we lever and pull the plant out of the soil, then cut off the root. This helps with the next task of replanting the space. It is much easier than cutting the plants at the base and then digging up the root. After the Chinese cabbage are all cleared, we might follow with kale or collards on January 24 to transplant outdoors as bare root transplants in March. If we have no plans for a follow-on crop that early in the year, we fill gaps in the Chinese cabbage plot until January 25, using “filler” Asian greens we sowed in October. After that date we fill all gaps with spinach transplants until February 20, and from then on we only fill gaps on the edges of beds, leaving the bed centers free for tomatoes, etc in mid-March. Grow Your Own Chinese Vegetables, Geri Harrington, 1984, Garden Way Publishing. Includes the names for these crops in different cultures. Growing Unusual Vegetables, Simon Hickmott, 2006, Eco-Logic books, UK. Kitazawa Seeds and Evergreen Seeds have the most choices. Evergreen has a helpful clickable list. Fedco Seeds and Johnny’s have a good range. Wild Garden Seed has many interesting home-bred varieties. Search under Mustard. 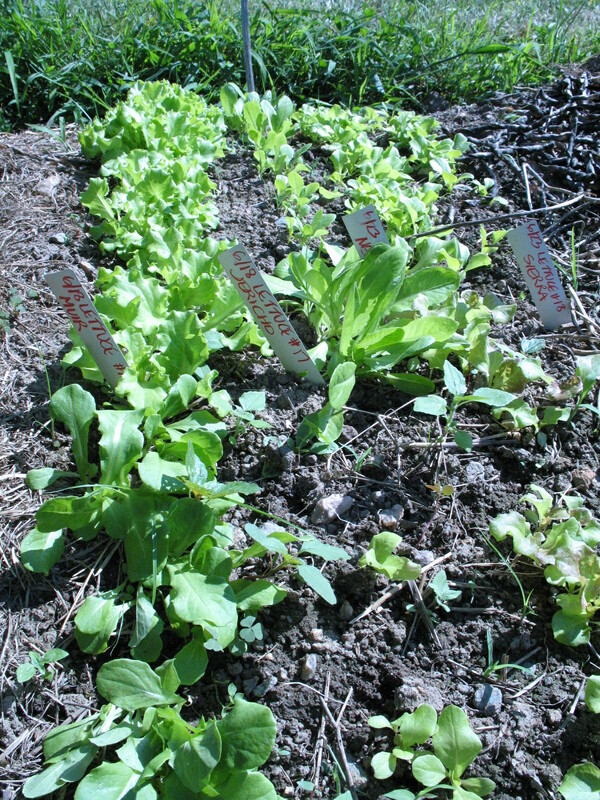 Lettuce seed bed, with Muir, Jericho, Sierra lettuces. Last week when writing about Lettuce Varieties for January I mentioned how we grow all our outdoor lettuce as bare root transplants. From January through to the end of April, we sow lettuce seed in open flats. After that date, we sow in outdoor nursery seed beds, and simply dig up the transplants when big enough and replant them in our raised beds. We transplant 120 lettuce outdoors each week until early October and then transplant in our greenhouse and our hoophouse. We also grow many other crops (all the easy to transplant ones) in open flats, or in nursery seed beds. This method has gone “out of fashion”, but perhaps it will come back in! Atina Diffley (Author of Turn Here Sweet Corn and Wholesale Success) has written a blog post about bare-root brassica transplants at atinadiffley.com/blog/. She has written a thorough-and-concise 9 page manual Seed Beds: Bare Root Field-grown Brassica Transplant Production. It includes a chart of pros and cons of bare-root transplants compared to container-grown greenhouse transplants. Using bare-root transplants does require a bit more attention to technique than popping plugs into the ground. But it’s not that difficult and we train new people every year with success. Bare-root transplants save a lot of time and money, compared to growing in flats. They also save on valuable greenhouse space. The plants get very sturdy, because they have the full depth of soil in which to develop big roots. 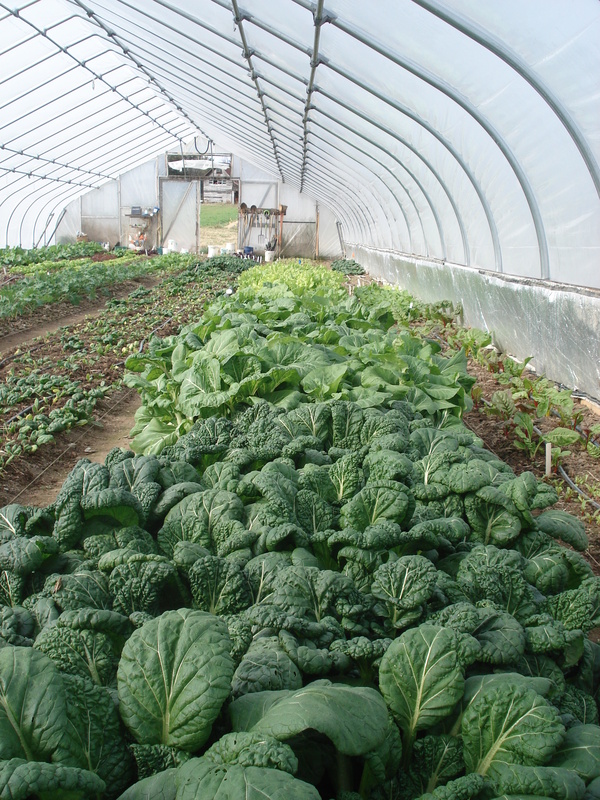 Starts grown in outdoor seedbeds are already acclimated to cooler conditions than plants in your greenhouse. 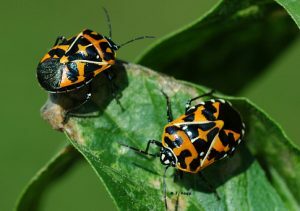 They are less prone to drying out than seedlings in flats, but do be ready to protect them from bugs. Bare-root transplants can suffer more transplant shock than plugs, so start with “easy to transplant” crops, such as brassicas (cabbage, kale, collards, broccoli, Brussels sprouts, kohlrabi), lettuce, onions and leeks. Tomatoes and peppers are worth trying next. See the Chart “Relative Ease of Transplanting Bare-Root Vegetable Seedlings” free online in Knott’s Handbook for Vegetable Growers. Avoid trying bare-root cucurbits (squash, melons, cucumbers). Bare-root transplants can be used on any scale, from backyard to large farm. See the impressive photos of huge beds of cabbage transplants in Atina Diffley’s manual. They can be used at various times of year, and from indoors to outdoors and vice-versa. Spring bare-root transplants started in a hoophouse, planted outdoors. For the earliest spring transplants, bare-root hoophouse starts are a nice option. For us, onion seedlings overwintered in the hoophouse have worked very well. 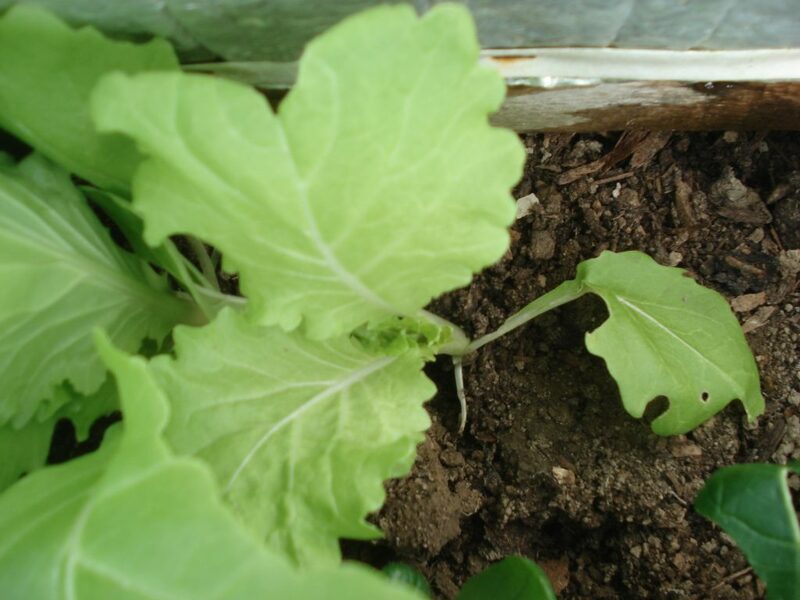 Seedlings outdoors or in a cold-frame suffer too much winter-kill. We don’t want to fuss with flats in November-February. We’re in zone 7, at 38̊ N. We sow onions in the soil in the hoophouse November 10 and 20, with a backup sowing on December 5. We plant them outdoors as early in March as we can. The onions get to thin-pencil-size by March 1, which we couldn’t do from a spring sowing. Onion roots are tough and thick, not thread-like – they are easy as bare-root transplants. We sow spinach, collards and kale in the hoophouse in mid-late January and plant them outdoors in early March. This is a lot less work than using flats, and our comparison trials with bare-root spinach showed results were just as good as spinach in Speedling plug flats. We have tried early lettuce transplanted from the hoophouse, but the plants were not as sturdy as those in flats. See my book Sustainable Market Farming, for more details of growing outdoor bare root transplants. We grow lettuce this way from April to September, and fall brassicas in June and July, in one of our permanent raised beds where the soil is friable and free-draining. Also see Atina Diffley’s manual for cultivation tips. We grow outdoor cabbage, broccoli, collard, senposai and Yukina Savoy transplants in seedbeds for 3-4 weeks in June and July, covered with ProtekNet on hoops. 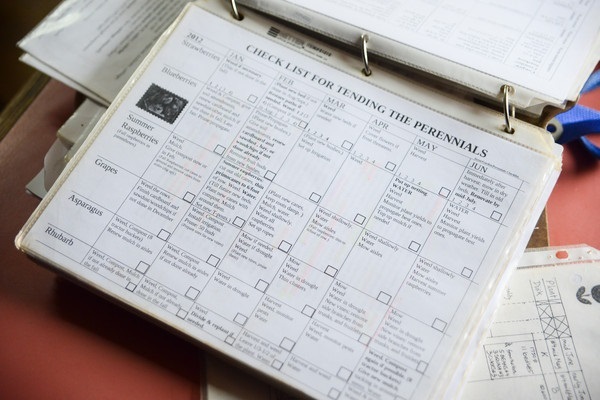 We transplant in July and early August for harvest in October and November. We prefer this to direct sowing, because it is much easier to keep the relatively small seedbed watered and bug-free. For large amounts use an EarthWay seeder. 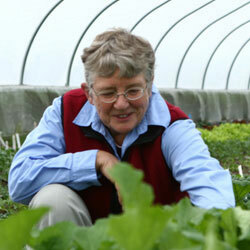 Atina Diffley recommends the leek seed plate for brassicas. In September we make an outdoor seedbed for crops to transplant into our hoophouse in October. The late summer hoophouse crops get a few extra weeks to finish up. 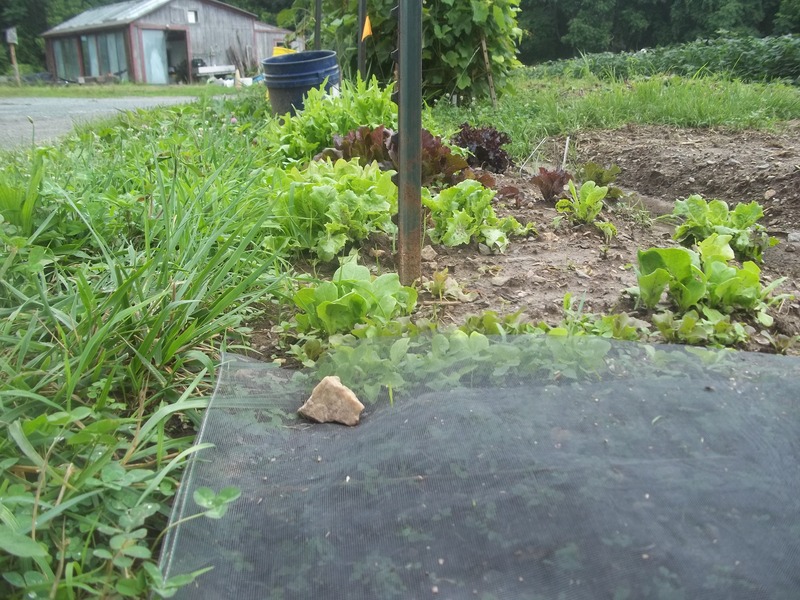 Because the hoophouse can be warmer than ideal for lettuce germination until well into fall, it often works better to start plants in a cooler location, then move the plants. In September in our climate, four-week old lettuce plants will be a good size. As well as ten varieties of lettuce, we sow various Asian greens and Brite Lites chard. Nine days later we sow another ten varieties of lettuce, white and red Russian kales, senposai and frilly mustards such as Ruby Streaks, Red Rain, Golden Frills, Scarlet Frills as well as green mizuna. We cover the seedbeds with hoops and ProtekNet and water daily. Transplanting these plants starts October 1 with the fast-growing pak choy, Chinese cabbage and Tokyo Bekana. The other transplants follow, as they reach the right size. 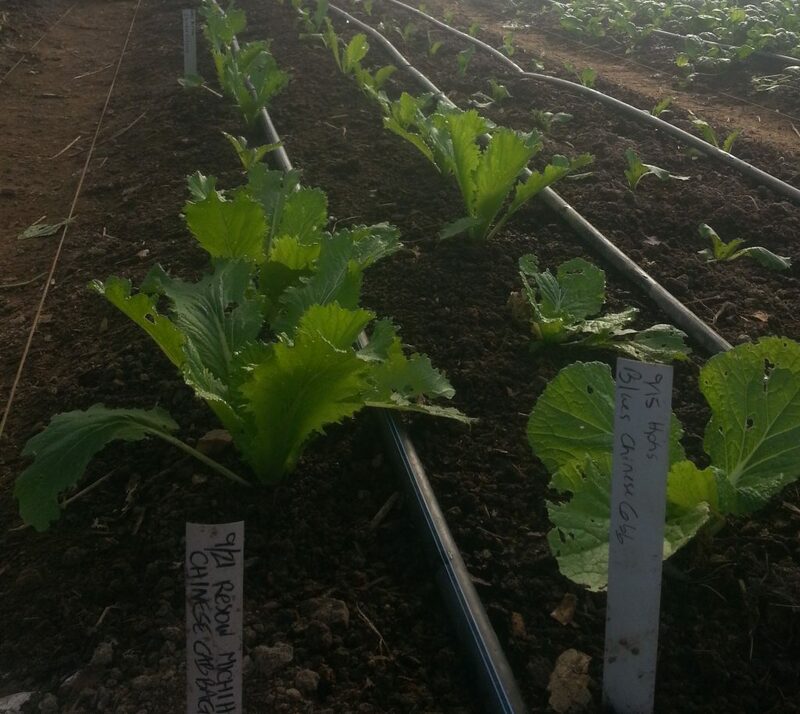 In October in the hoophouse we sow short rows of “brassica fillers”, mostly senposai, Tokyo Bekana and Maruba Santoh. These grow fastest, which becomes more important in the dark winter days. We fill gaps in any brassica bed, that occur either because of disease, or of harvesting. 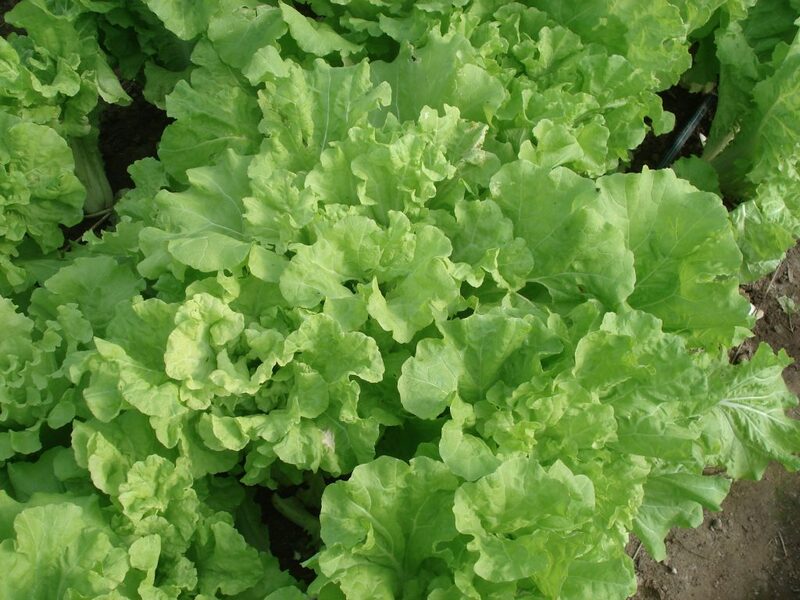 In late October and early November we sow filler leaf lettuce varieties and filler spinach. These extra plants help us out if something goes wrong, and give us the chance to grow some extra crops after the first ones have been harvested. Our formula for sowing seedbeds in the hoophouse is to divide the final row length of brassica plants by 10 to give the minimum length of seed row to sow. These plants will be transplanted 10″-12″ (25-30 cm) apart. For onions (to be transplanted 4″ (10 cm) apart), we divide the number of plants wanted by 20 to give the row feet (67/m), but we sow this amount twice, about 10 days apart. Outdoors for the fall brassicas, we sow around a foot (30 cm) of seed row for every 12′-15′ (3.6-4.6 m) of crop row, aiming for 3-4 seeds per inch (0.75 cm apart). These plants will be transplanted 18″ (46 cm) apart. 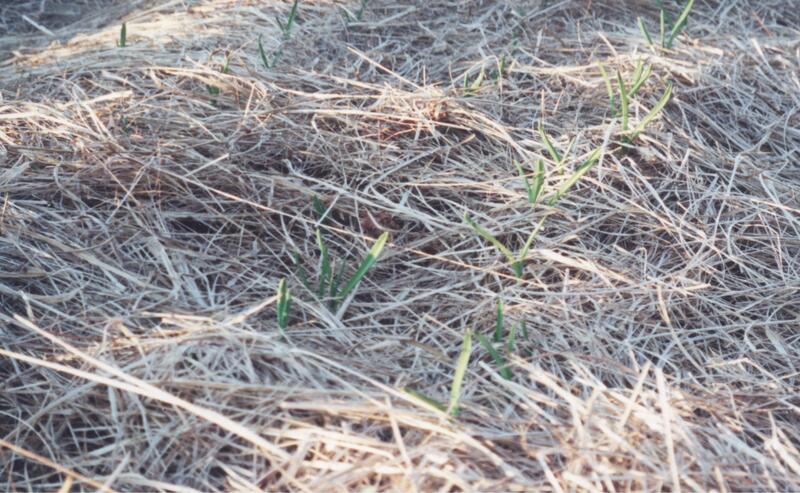 It’s important to weed and thin the seedlings to 1″ (2.5 cm) apart soon after they emerge. There is quite a lot of flexibility about when a start can be transplanted, but there are accepted ideals to be aimed for. 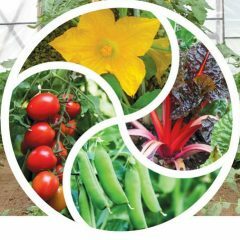 The University of Florida Vegetable Horticulture Program Vegetable Transplant Production page has a wealth of transplant information. Transplants grown over winter or in very early spring in a hoophouse will take longer to reach plantable size than those sown in spring or summer. The ideal conditions for outdoor transplanting are mild windless afternoons and evenings just before light steady rain. Transplanting late in the day gives the plant the chance to recover during the cooler night hours when transpiration is slower. 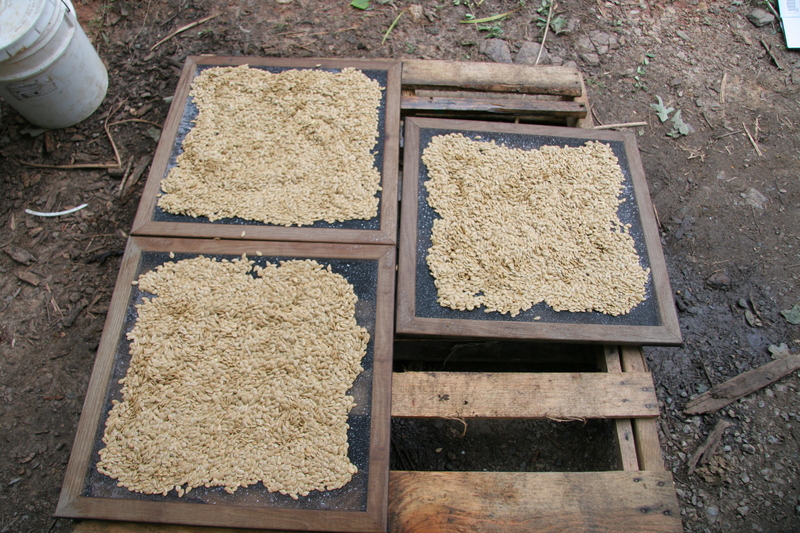 Shadecloth or rowcover can reduce the drying effects of wind and sun. Damp soil is important before, during and after transplanting. When you dig up your bare-root transplants, leave some soil clinging to the roots, to help the plants re-establish quicker. They don’t need a full handful of soil for each plant. Just dig up a clump and give it a light shake, to leave the majority of the soil behind, and some still on the roots. This means less damage to the root hairs. Be sure to dig deep enough so you don’t damage the tap roots. Water your plants the day before and an hour before lifting (pulling) them. In hot weather, keep the plants as shaded as possible while transplanting.If necessary water the soil ahead of planting. We use plastic dish-pans to carry our plants from seedbed to field, and I tell people to only dig up what they think they can transplant in half an hour, so that plants don’t sit around for too long. Push the trowel into the soil, using the dominant hand, push it forwards, shake a plant loose from the clumps in the dish-pan with the other hand, and slip a plant in behind the trowel. Pull out the trowel, keeping it in your hand while you close the soil against the stem with your planting hand and the trowel. (Efficient workers keep a hand on the trowel at all times, never setting it down.) Move to the next spot and repeat. When setting out a large number of plants, water every 20-30 minutes if you don’t have drip irrigation running (a bit less often if you do) regardless of the number of plants set out. If the person is skilled and moving fast, and the weather is not outrageously hot or windy, I might let an hour go by before pausing to water. The advantage of getting a lot of plants in the ground proficiently and quickly might outweigh the need to water more often, as the plants are not having their roots exposed to the air for as long when they are planted fast. The hand-watering really helps the soil settle around the roots, and after that the damp soil can wick moisture from the irrigation towards the plant. Water your plants the day after transplanting, on days 3, 7 and 10, and then weekly, if it doesn’t rain when you’d like it to. 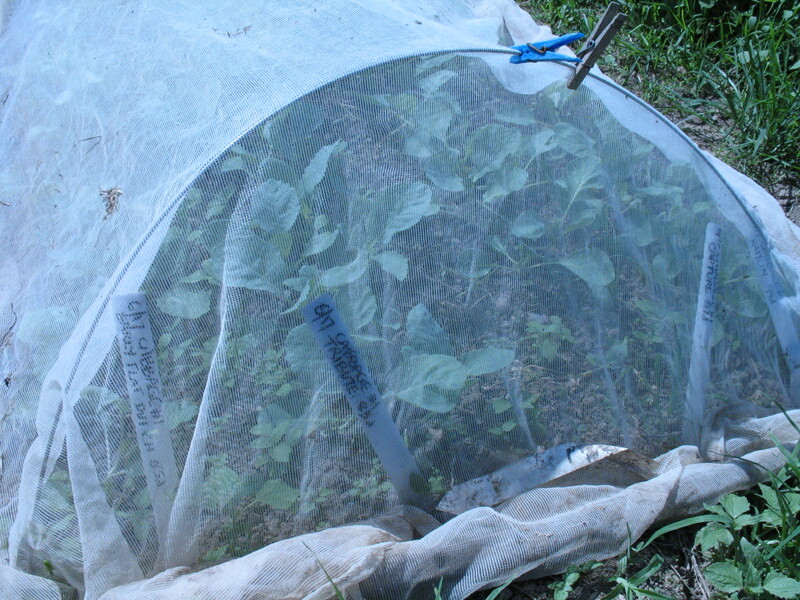 Shadecloth draped over recently transplanted crops can help them recover sooner from the shock in hot sunny weather. 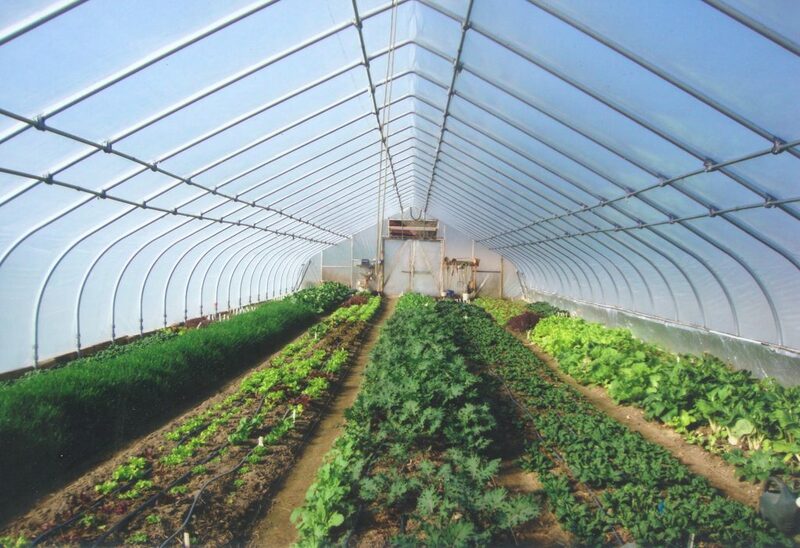 We use 50% shade, in 6′ (1.8 m) width, with wire hoops to hold the shadecloth above the plants. This improves the airflow as well as reducing the abrasion or pressure damage done to the plants. The airflow through shadecloth is better than with floating rowcovers. ProtekNet allows good airflow too, and keeps bugs off. Shade cloth on lettuce seed bed. Author farmerpamPosted on January 10, 2017 Categories farm planning, Sustainable vegetable productionTags Asian greens, Atina Diffley, bare root transplants, Chinese Cabbage, Efficient workers keep a hand on the trowel at all times, Fall Brassicas, How much to sow, Knott's Handbook for Vegetable Growers, lettuce seed bed, maruba santoh, outdoor lettuce as bare root transplants, outdoor nursery seed beds, outdoor seedbed for crops to transplant into our hoophouse, pak choy, Proteknet, Relative Ease of Transplanting Bare-Root Vegetable Seedlings, Seed Beds: Bare Root Field-grown Brassica Transplant Production, senposai, shade cloth, Spring bare-root transplants started in a hoophouse, Suitable conditions for transplanting, Tokyo bekana, Transplant age and size, transplant shock, Turn Here Sweet Corn, University of Florida Vegetable Horticulture Program Vegetable Transplant Production page, water every 20-30 minutes, Wholesale Success, Why bare-root transplants? Here we are in the shortest days. What are we harvesting from our hoophouse (high tunnel)? Many different crops, mostly leafy greens, but with the addition of radishes, turnips and scallions. I’ll start with those. 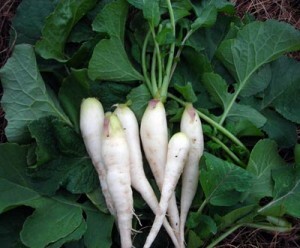 We’re harvesting our third sowing of radishes, sown on 10/30. We like the vari-colored Easter Egg radishes and the long White Icicle for this time of year. Cherry Belle also works in this sowing, but not later. Like Sparkler, it gets too fibrous in winter. Our favorite scallions are Evergreen Hardy White, which are extremely cold tolerant. They are also slow to grow. We are starting to harvest the ones we sowed 9/6. The second sowing (which followed the first radishes on 11/18) are just spindly little blades so far. 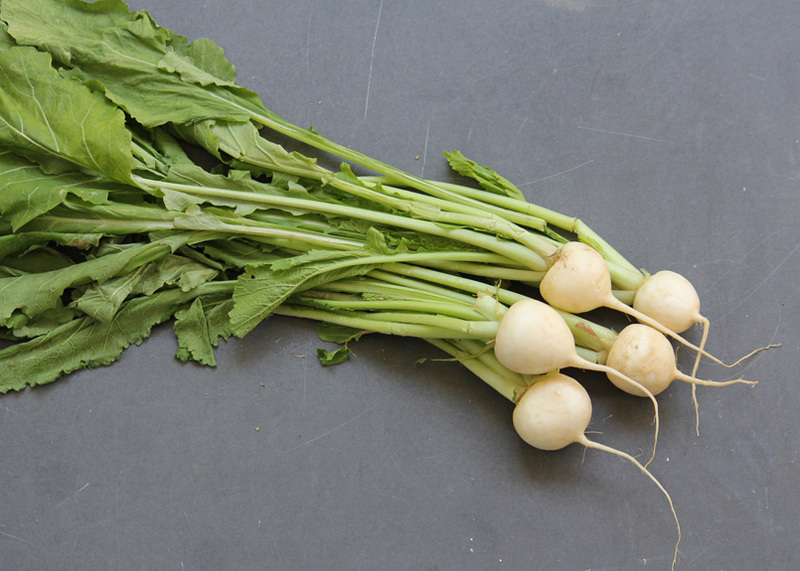 The turnips (and their greens) which we are starting to harvest at tangerine-size, are Hakurei and Red Round, from a 10/14 sowing. We made a second sowing of turnips on 10/26, but we over-watered them and got patchy germination. We filled the gap with a late sowing of brassica salad mix. This is a mixture of random leftover brassica seeds (varieties we didn’t like, seed that is getting a bit old) which we sow and then cut with scissors about an inch above the soil once they get to about 4″ tall. Baby lettuce mix in the hoophouse. Just like baby lettuce mix. We are on our second cut of our 10/24 lettuce mix. 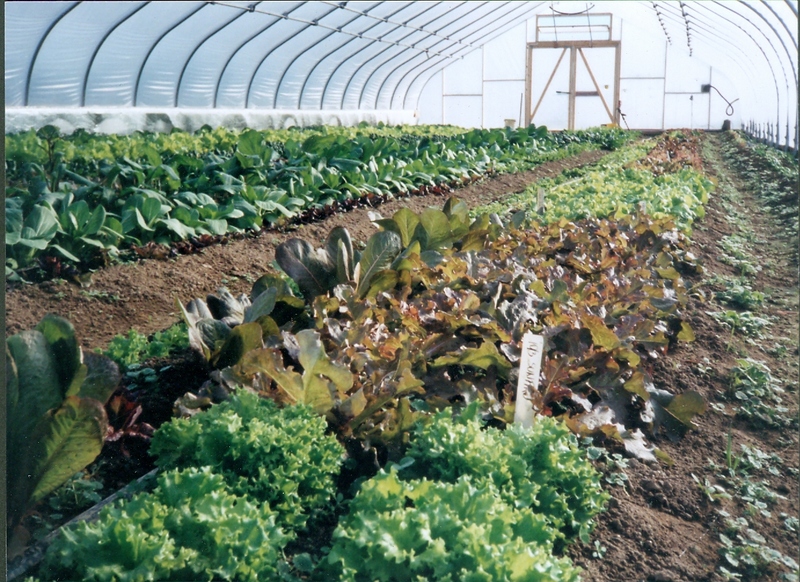 We buy the mix already made, although if we get close to running out of seed, we have been known to mix in some seed of basic varieties like the Salad Bowls, that do well in the winter high tunnel. We also have lots of big lettuce plants. We take leaves off those for our salad mixes when we don’t have baby lettuce mix at the right stage for cutting. Into the salad mix we add chopped mizuna and its spicier cousins Golden Frills, Ruby Streaks and Scarlet Frills. These add loft, visual interest and flavor. 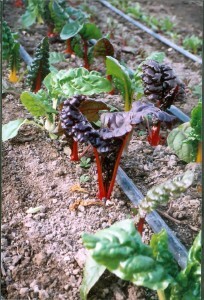 For color we also add chopped Bulls Blood beet leaves and chopped small leaves of Brite Lites chard. As well as mixing the colors and shapes, I try to have at least one representative of each of three crop families: spinach, chard and beets; lettuce; brassicas such as mizuna, baby kale leaves, small leaves of Tokyo bekana, Yukina savoy, tatsoi. For cooking greens we are harvesting leaves of Russian kale (transplanted 10/22), our first chard (transplanted 10/16), spinach (sown 9/6 and 10/24), senposai (transplanted 10/24), Tokyo bekana (transplanted 10/9) and Yukina savoy (transplanted 10/24). 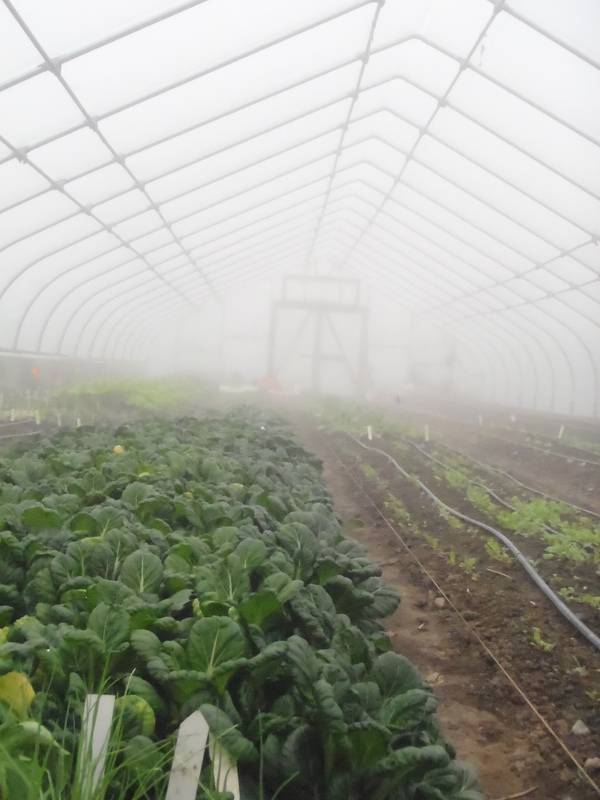 it takes 10 gallons of greens to provide 100 people with a healthy serving each. 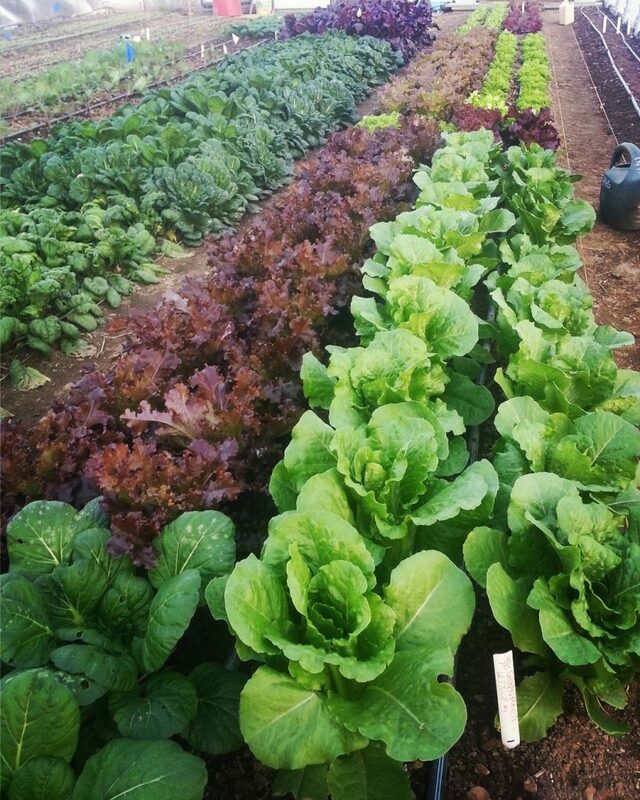 We aim to provide the cooks each day with a choice of two or three different cooking greens. We are also harvesting some greens as whole heads now. We are clearing our first planting of tatsoi (sown 9/7), which has been getting ready to bolt for a couple of weeks now. Likewise the Tokyo bekana, which starts to bolt at the end of December. Hoophouse Yukina savoy at the end of November. We are also cutting big heads of Chinese cabbage and Pak Choy. As we harvest these, we fill the gaps at the end of the day with replacement plants. My current favorite is senposai, as it is very quick to grow and can be eaten at any stage. (And of course, it’s very tasty, otherwise I wouldn’t even mention it!) We reckon 12/31 is the last worthwhile date for us to do this gap filling with Asian greens. 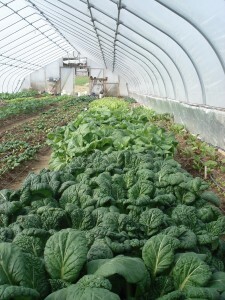 After that we use spinach or lettuce transplants up till 1/25, then only spinach (up till the end of February). We’ve found that planting after those dates doesn’t produce harvest, just wasted time! The Yukina savoy doesn’t really start bolting until the last week of January normally, but with the freakish warm weather we’ve had this December, we might get early bolting. I don’t know if this crop bolts mostly in response to day length or to temperature. I guess we’ll find out. We’ve ordered our seeds, we’re planning our next hoophouse crops and our schedule for sowing seedlings in the greenhouse. And this is the slow season! 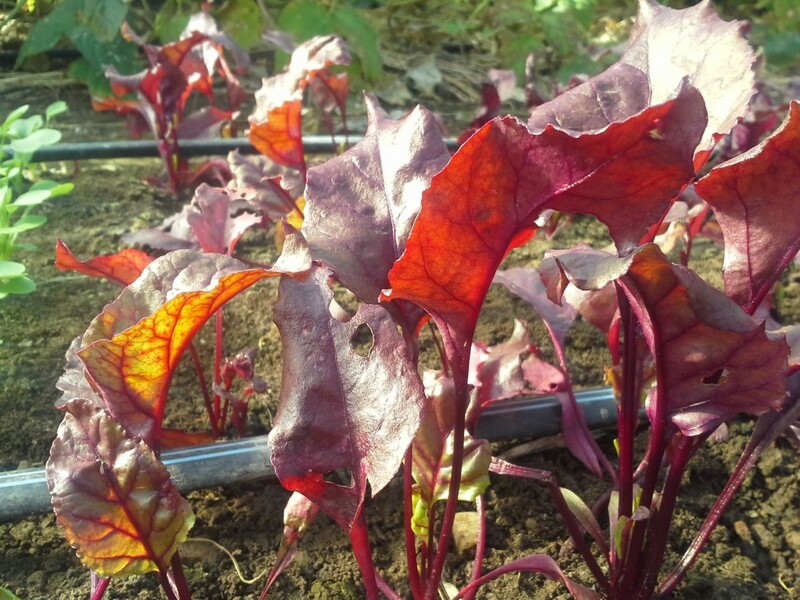 Bulls Blood beets add intense color to salad mixes. Workshops on Crop Rotations, Hoophouses in spring, summer, fall and winter. I had a good time at the Heritage Harvest Festival this past weekend. My Friday workshop on Crop Rotations for Vegetables and Cover Crops in the Woodland Pavilion had about 56 participants. If you missed it or want to see it again it’s here. Most of my slide shows are on SlideShare.net. Search for Pam Dawling and click on the one you want to see. Brite Lites chard in our winter hoophouse. On Saturday I did my presentation on Asian Greens. And this morning I sowed Blues Chinese cabbage, Yukina savoy, Tokyo Bekana, and pak choy, as well as Brite Lites Chard and ten kinds of lettuce, to transplant into our hoophouse for winter greens. Last winter we tried the Osborne Multileaf lettuces compared to Salanova types, and were well pleased with the Osborne ones. And so we are growing more of those this winter, along with Tango, Panisse, Oscarde, Merlot and Red Tinged Winter. Next week I’ll sow another ten lettuces (some of the same and some others), along with Russian kales and senposai, more Yukina Savoy and the first round of mizuna and fancy frilled mustards, such as Ruby Streaks. Next weekend (September 18-20) I will be speaking at the Mother Earth News Fair in Seven Springs, Pennsylvania. I”l be one of the Keynote Speakers, talking about Fall and Winter Hoophouses on Friday 4 – 5 pm on the Mother Earth News Stage. Then I will sign books in the MEN Bookstore immediatley following the workshop. On Saturday 10 – 11 am on the GRIT Stage I will speak about Spring and Summer Hoophouses. That pair of workshops should give plenty of ideas for the whole year. I’m also doing off-stage demos of tomato string-weaving (using a table-top model) twice a day at the New Society Publishers booth 104. Because printing 600 handouts is out of the question (too many trees would have to die, and so on), I have made pdfs of my handouts to post here. Click on the links. Cucumbers and squash in our early summer hoophouse. The heart of a Chinese Cabbage in our hoophouse. Today we have a snowstorm again. Tonight is forecast to be much colder than usual for this time of year – 0-4F. I’ve been out in the hoophouse bouncing snow off the roof with the bristle end of a broom. I did harvest a bucket of salad mix and two buckets of Chinese cabbage, which was starting to bolt. I set the buckets of produce outside for a short while and the veg started to freeze! I was busy rolling out rowcover over the beds. This is the first winter we have needed rowcover for winter crops, sigh. Meanwhile, over in the greenhouse we have thousands of small seedlings. I covered all those with rowcover too, and put the potted-up tomatoes back in the germinator-fridge cabinet, where they can get some warmth (if the power doesn’t go out). I plugged in an electric heater set at 45F. I have never ever needed to do this before. Climate change does add stress to the farmer’s life, and more possibility of losing crops. Sigh again. Before this snow though, we managed to make good progress outdoors. While the soil was still really wet from the last snow-melt we pruned blueberries and grapes. Our grape rows from the north. This photo of our grapes was taken a couple of years ago, slightly later in the year. You can see the vines are budding out, and the rhubarb is coming up. Our grapes are mostly Concord, a variety good for juice and jelly, which is disease-resistant (important on the East Coast). We use the Geneva Double Curtain training style, which lets more sunlight and air in, a distinct advantage in our humid summers. 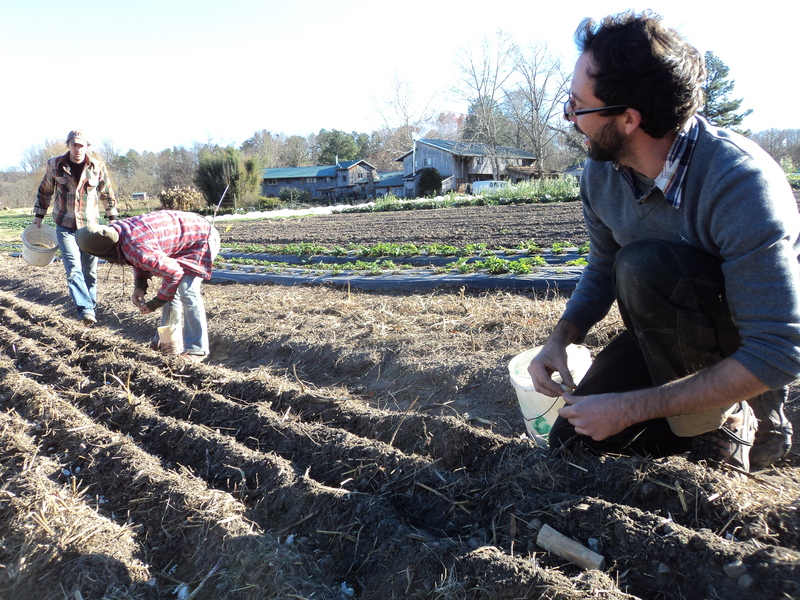 As soon as the soil dried out, we tilled all the beds we’d spread compost on, and started prepping them for planting. Because of the cold weather forecast, I didn’t want us to start transplanting spinach or onions, even though we are later than most years with those. We did sow two beds of carrots, so we’ve made a start! It felt good to make so much progress, even though I knew we’d have to sit indoors again today and probably tomorrow too. The only other thing we’ve planted outside this year is a small patch of shallots. But we’re on our way! What’s still alive after two nights at 4F? Recently I reported on which crops were still alive after two nights at 14F (-10C) and several others in the teens. We’ve now had the Arctic Vortex, which in our part of central Virginia, meant two nights at 4F, last Monday 1/6 and Tuesday 1/7 nights. How did it go? Before the Prelude to the Big Chill, when we got 9F, I harvested the odds and ends of small cabbages left in our main patch. Quite worthwhile, I got two 5-gallon buckets. Between the 9F and the 4F nights, I decided to gather the Deadon cabbage, which we grew with January harvests in mind. There was some freeze damage, so in future I’ll say that Deadon is good down to 10F, but not lower. I got two full net bags and two more buckets of small ones. I left one smaller and one larger cabbage as sacrificial victims in the cause of better information for next year. When we got 4F, the smaller one died and the larger survived. One of the other gardeners harvested the last of the outdoor senposai. Another couple of buckets of tasty food. I took another walk round the frozen garden after the Big Chill, to see what is still alive. We have Tyee spinach under rowcover, and Vates and Beedy’s Camden kale without rowcover. They are all still alive! There’s some freeze damage in spots on the spinach leaves, but plenty of good meals still to come! Our hardneck garlic tops suffered some damage but didn’t get killed back to the mulch level. The Polish White softneck tops are considerably smaller and they too are still alive. They will grow back if they have died. Still alive in the centers – Winter Marvel, North Pole, Tango, Green Forest. No longer alive – Salad Bowl, Red Salad Bowl, Winter Wonder, Red Tinged Winter, Merlot, Red Sails, Outredgeous, Roman Emperor, Revolution. At nearby Acorn Community, the home of Southern Exposure Seed Exchange, they had some young but mature heads of cabbage outdoors. The Late Flat Dutch, Early Flat Dutch and Chieftain Savoy all survived one night at 6F. (It’s usually two degrees warmer there than at Twin Oaks on winter nights). 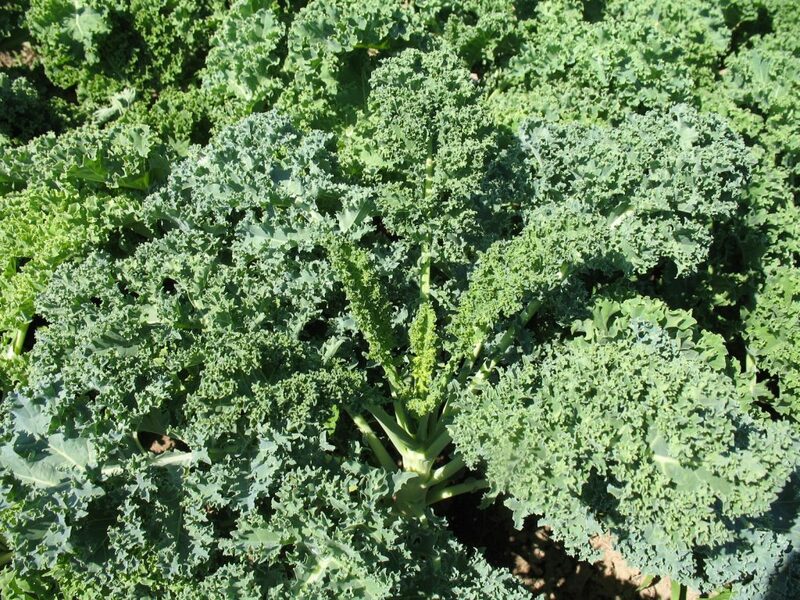 Meanwhile I’m tracking the Blue Ridge kale grown by Clif Slade in his 43560 project at Randolph Farm, VSU. The Blue Ridge survived. It got down to 9F there. Not as cold as Louisa County! Blue Ridge is taller than the Vates we grow, and I’d like to try it here, if it can survive our winters. Otherwise not! In the hoophouse, we covered all the beds with thick rowcover on Monday afternoon, and didn’t roll it up till Thursday, after the warmer weather returned. There was a tiny bit of freeze injury on some turnip greens that poked out the side of the rowcover, and some on some stems of Tokyo Bekana. I think the rowcover saved the crops! Also, a bad thing happened. it was very windy Monday night and the west window blew open. Argh! Of all the nights to have an open window. Memo: fix the latch to make it stronger. I didn’t enjoy the really cold weather. I was anxious about the crops and the plumbing! But I can see two silver linings: I now have more information about cold-hardiness of various crops, and hopefully some pests will have died. Now we’re getting ready for another two cold nights, tomorrow and Wednesday. When we placed our seed orders we gave up for this year on our quest for a reliable red cabbage of at least medium size and fairly speedy maturity (90 days or less). We’re having a red-cabbageless year. We’re still open to recommendations (OP or hybrid) – please leave a comment. What’s still alive at 14F? 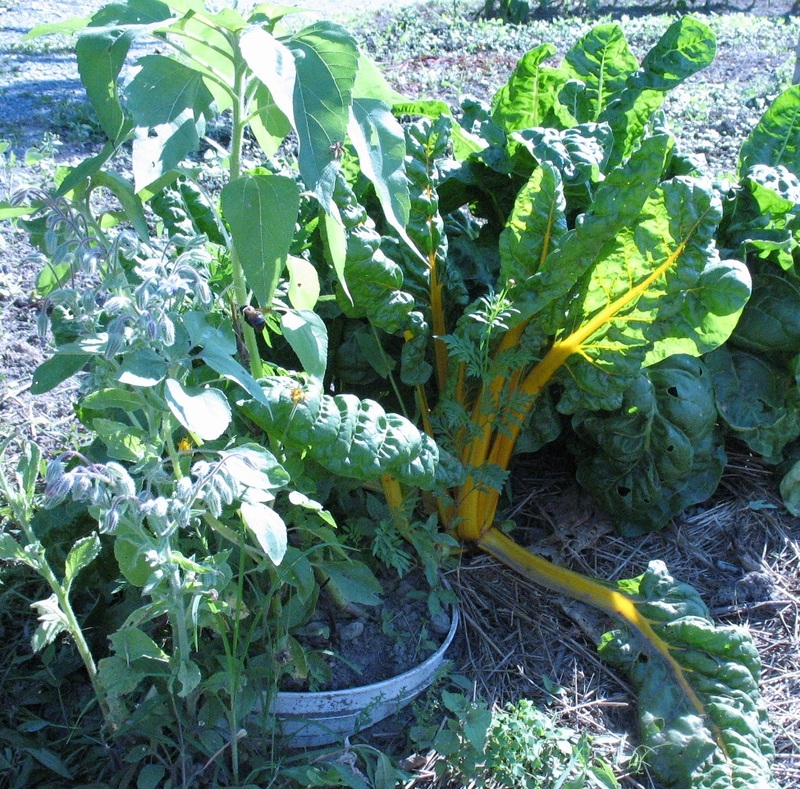 One of my ongoing topics of interest in the garden is how cold-tolerant various vegetables are. We’ve now had two nights at 14F (-10C) and several others in the teens. I took a walk round the frozen garden this morning to see what is still alive. We have Tyee spinach under rowcover, and Vates kale. The senposai is still alive, but some of the midribs have brown streaks. 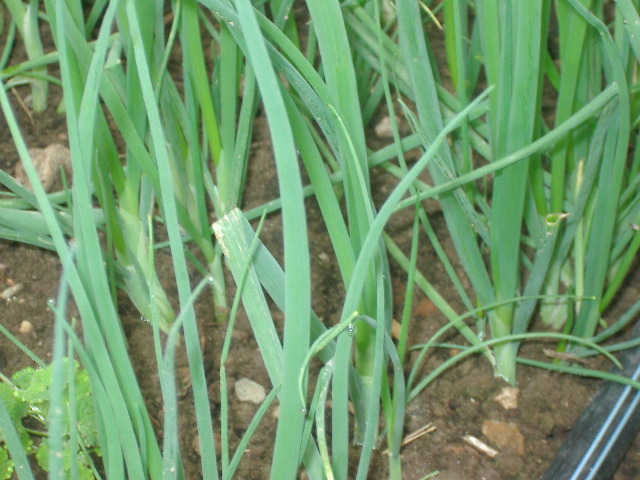 Sadly we don’t have any leeks this winter, as we lacked enough workers to tend them in late summer. We have a nice bed of Deadon cabbage, and I notice that some small heads of Melissa savoy that missed the bulk harvest are also alive. The Gunma cabbage stumps have some leaves and tiny heads still alive, but the Tendersweet are done in. Our ongoing quest for a reliable red cabbage of at least medium size and fairly speedy maturity (90 days or less) yielded no success story this year. We grew Super Red 80 happily for many years, but then it stopped working for us – variable heads, slower maturity. If you have any recommendations (OP or hybrid) please leave a comment. We are working on our seed orders now, and this would be a great time to have some suggestions. Back to today – our chard had all the leaves cut off in November, and seems to be dead. Some winters it hangs on later, if we leave some foliage to help it regenerate. We have also some years deliberately kept it alive for spring by using rowcover on it. We do that if we go into winter short of spinach beds. The oats cover crop we sowed in August and early September look pretty much dead. All the broccoli looks dead. That’s as expected for the temperatures. Often we don’t get nights this cold till January – the cold came early this winter. Our hardneck garlic tops look to be in good shape. The Polish White softneck tops are considerably smaller and look like they are suffering. They will grow back if they have died. Some of our Chandler strawberry plants look dead. Either that or they are extremely dormant! The deer were killing them off by eating the leaves. Too many deer! The hoophouse is still bursting with great food. Plenty of salad greens: lettuce; various kinds of mizuna and ferny mustards like Ruby Streaks and Golden Frills and Bulls Blood beet leaves. And for salads or cooking we have spinach, chard, tatsoi, radishes, scallions, baby Hakurei turnips and their tasty greens, Red and White Russion kales, and more senposai. 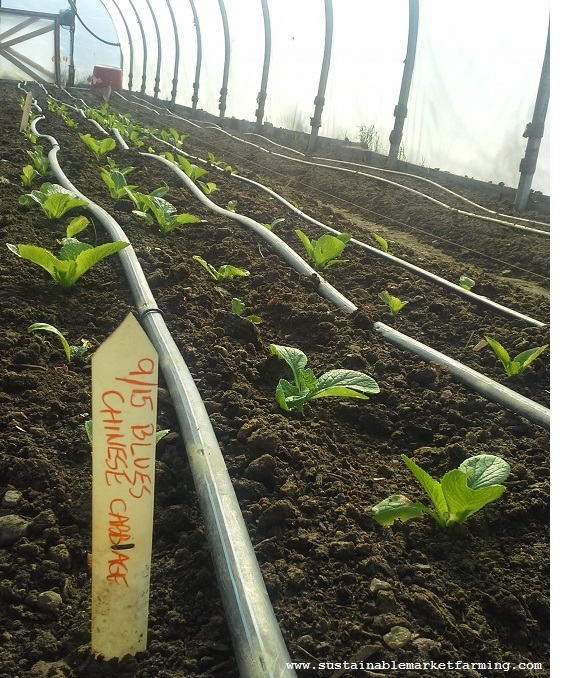 Soon we’ll start on the heading Asian greens: pak choy, Chinese cabbage, Tokyo bekana and Yukina Savoy. The first sowing of tatsoi (9/7) is starting to bolt, so we’re clearing that. The second sowing (11/15) needs thinning to an inch. The first round of baby lettuce mix (10/24) is ready for its second cut. In a few days we’ll make a second sowing of that. I love working in the hoophouse on sunny winter days. This afternoon I plan to complete the transplanting of an 11/9 sowing of spinach. We just love the sweet nuttiness of winter spinach! Author farmerpamPosted on December 26, 2013 Categories hoophouse, This week in the gardenTags baby lettuce mix, Bulls Blood beets, Chandler strawberries, chard, Chinese Cabbage, Cold-Hardy Winter Vegetables, Deadon cabbage, deer eat strawberries, Ezra Freeman, ferny mustards, garlic tops grow back after being frozen, Golden Frills, Gunma cabbage, Hakurei turnips, hardneck garlic, lettuce in hoophouse, melissa Savoy cabbage, mizuna, oats cover crop dead at 14F, overwintering chard, pak choy, Polish White softneck garlic, radishes, red cabbage variety, rowcover for winter vegetable crops, Ruby Streaks, Russian kale, scallions, senposai, spinach, Super Red 80 cabbage, tatsoi, Tendersweet cabbgae, Tokyo bekana, turnip greens, Tyee spinach overwinter, Vates kale, vegetable crops alive at 14F, winter hoophouse crops, winter spinach, Yukina savoy2 Comments on What’s still alive at 14F? See you at Little Rock for SSAWG, with books! The Southern Sustainable Agriculture Working Group Conference “Practical Tools and Solutions for Sustaining Family Farms” is coming right up. January 23-26 at the Statehouse Convention Center and Peabody Hotel, Little Rock, Arkansas. I’m surprised to find I haven’t already told you about it. I’m contributing to three workshops (I’ve been busy preparing the slide shows and presentations – maybe that’s why I forgot to mention it! Right in front of my nose every day.